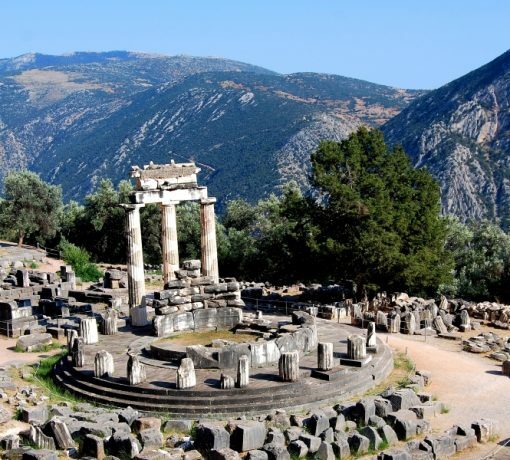 At the foot of Mount Parnassos, within the angle formed by the twin rocks of the Phaedriades, lies the sanctuary of Delphi, which had the most famous oracle of ancient Greece. According to mythology, it is here that the two eagles sent out by Zeus from the ends of the universe to find the navel of the world met. The sanctuary of Delphi, set within a most spectacular landscape, was for many centuries the cultural and religious center and symbol of unity for the Hellenic world. Between the sixth and fourth centuries BC, the Delphic oracle, which was regarded as the most trustworthy, was at its peak. It was delivered by the Pythia, the priestess, and interpreted by the priests of Apollo. Cities, rulers and ordinary individuals alike consulted the oracle, expressing their gratitude with great gifts and spreading its fame around the world. Visit of the archaeological site and the Museum where one can see among other archeological treasures, the unique bronze statue of the Charioteer dedicated to Apollo by Polyzalos, the tyrant of Gela, in 478 B.C. when he won the chariot-race at the Pythian Games. This incomparable statue is a representative example of the ”severe” Attic style, certainly the work of a major artist.